Carter may not get his nuggs, but Wendy's got its publicity. Will Carter get his nuggs? Wendy’s isn’t saying, but the company has revealed the social engagement it’s seen from the teen’s viral tweet -- and that is a prize in itself. Since April 5, when Wendy’s challenged 16-year-old Carter Wilkerson from Reno, Nevada, to amass 18 million retweets to win a year’s worth of chicken nuggets, the brand has been reveling in its sudden social fame. "We knew that the love for Wendy’s nuggets ran deep," said Frank Vamos, director of brand communications at Wendy’s, in an email, "but we didn’t expect the overwhelming response we’ve seen on Twitter to Carter’s love of nuggs." The response has been insane. @Wendys has earned 330 million social impressions and has gained 149,000 new followers on Twitter. Other tweets from the brand have also seen a lift in engagement, generating 280,900 retweets and 978,500 likes. The engagement stems from Wilkerson’s tweet requesting retweets. The "movement" has received an onslaught of supporters—from large tech companies such as Apple and Microsoft, to Ellen DeGeneres, who stands to lose her reign of having history’s most-retweeted post. Carter’s tweet now has more than 3.2 million retweets, less than 200,000 away from breaking DeGeneres’ Oscars selfie, but should he still win the nuggs even if his tweet doesn't reach 18 million retweets? Take our poll. The reaction is also due in part to Wendy’s social strategy with agency partner VML, which runs the brand’s much-heralded Twitter feed. 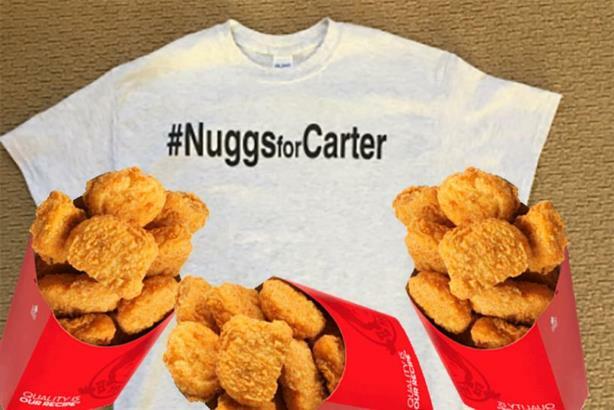 If the brand hadn’t responded to Carter’s love of nuggs, there would be no #NuggsForCarter. "Part of our brand voice is being a challenger with charm," said Vamos, "so it helps guide our social team in engaging with our fans in very different ways that can help distinguish us."